Celebrate Ugly Christmas Sweaters With These Tees! Funny Ugly Sweater Designs On A T-shirt! How many People out there besides me that is, are not a fan of Christmas sweaters? I have seen many new party themes popping up using the UGLY CHRISTMAS SWEATER as the basis! I think it is definitely a holiday tradition that should be carried on, for adult parties! In my family it has always been my mother wearing the dreadful sweaters, until the past 5-6 years as she now resides in southern Texas and it is way too hot down there to be wearing her treasured sweater collection. 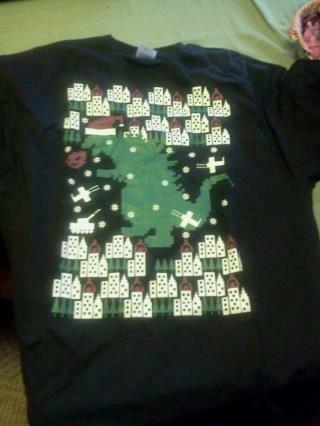 This year she will be dressed in style with this Ugly Sweater tshirt that I have received! The tshirt itself is preshrunk and made out of 100% cotton, it is of high quality material that does not shrink, or come out of the dryer looking like an old dish rag. I personally hate when I buy a tshirt and after one wash come out thin, misshapen and just look like an old rag. Guaranteed you won’t receive anything like that from Ugly-Christmas-Sweater- tshirts.com! You can click the above red link to view all of their wonderfully funny and ugly sweater tshirts available!